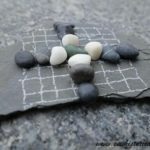 I wanted to make a game with rocks for a long time! 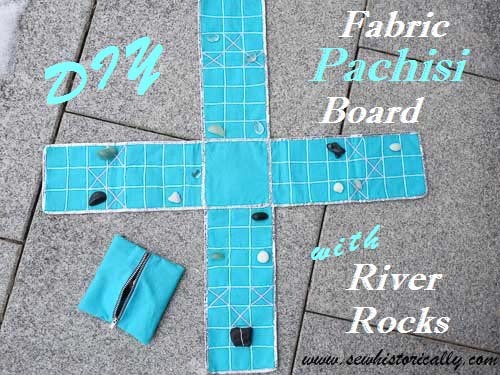 So this Christmas I sewed a fabric pachisi board using river rocks as game pieces. 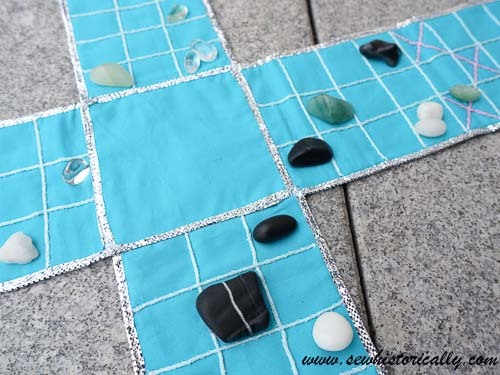 Sewing a pachisi board is very easy and a great way to use up fabric scraps. 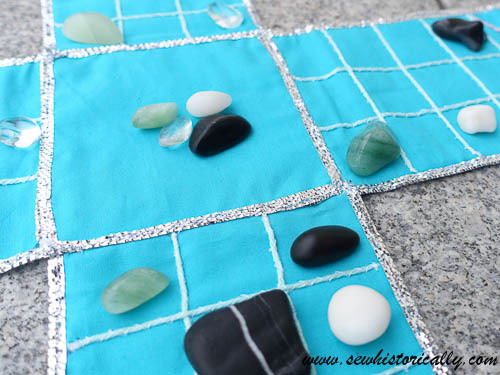 Pachisi is an ancient Indian game – it’s also known as chaupar, pagade and by many other names. 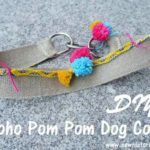 The board is usually embroidered on cloth: It can be very plain (V&A felt pachisi board with gold thread) or richly embroidered with pearls, beads and silver thread (1800-1900 velvet chaupar board). 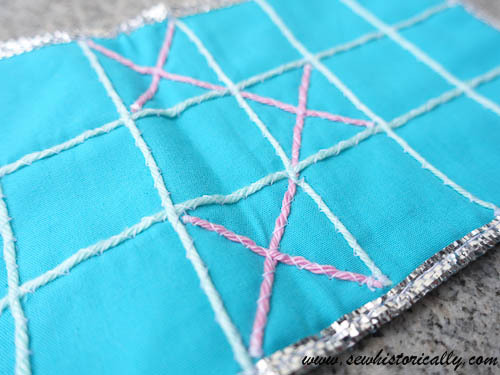 I decided to make a plain pachisi board with things I already had in my stash: turquoise cotton fabric scraps left over from a full circle skirt, silver ribbon and cotton yarn in mint green – left over from my mint green crochet lace sweater – and pink. 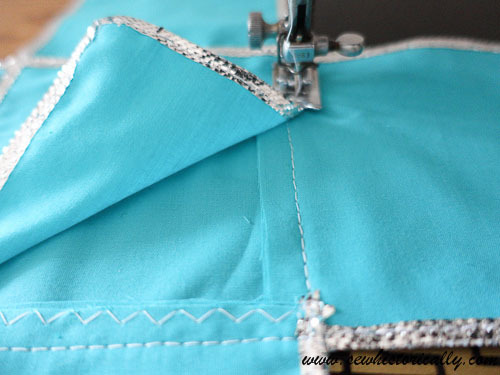 I used two layers of fabric for each arm which I zigzagged together – two layers of fabric make the fabric board stronger. Then I bound three edges of the arm with silver ribbon. 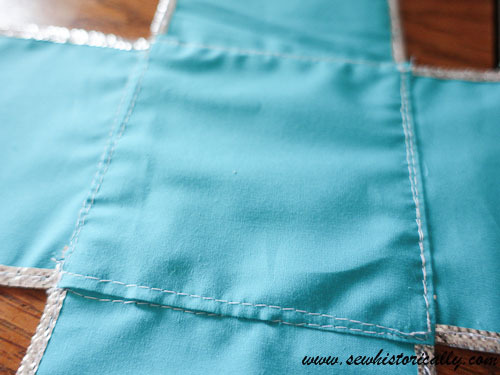 I sewed the four separate arms to a fabric square. 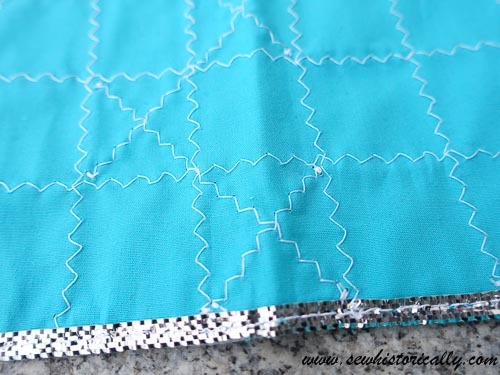 Then I bound another turquoise fabric square with silver ribbon and used it to cover the raw edges. 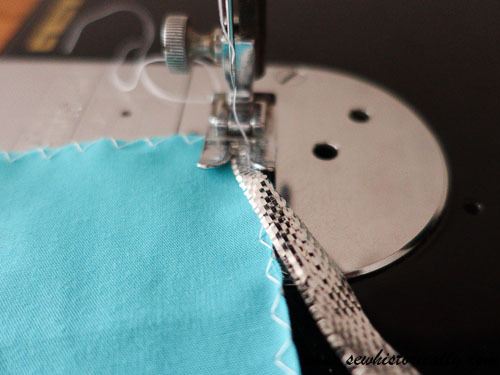 To mark the squares, I zigzagged mint green yarn to the fabric. 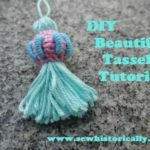 For the castle squares I used pink cotton yarn. 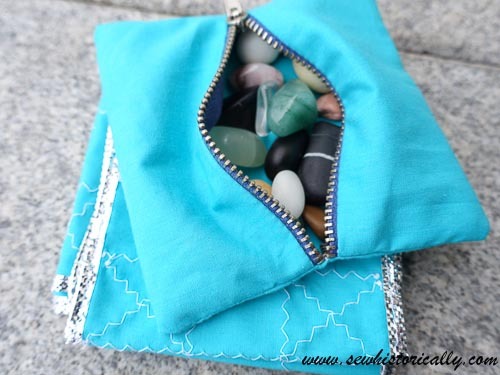 I also sewed a zipper bag for the river rocks. 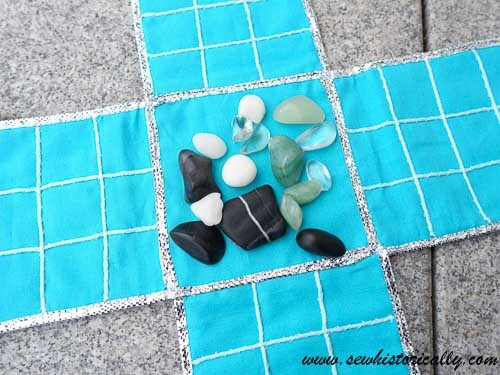 Most of the stone game pieces are collected river rocks and some are bought semi-precious stones. The colors of the rocks are black, white, green, crystal, pink, yellow and brown. We prefer to play with the green, white, black and crystal river rocks. I oiled the rocks with jojoba oil to make them shiny and bring out the color. And because the colors are so similar: some cookies with natural blue frosting (colored with red cabbage and baking soda). 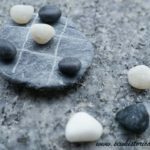 Here’s a website with instruction on how to play pagade (pachisi). 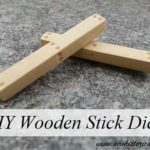 Love how you made this! Great portable game. Thanks for sharing on Funtastic Friday! Thank you! 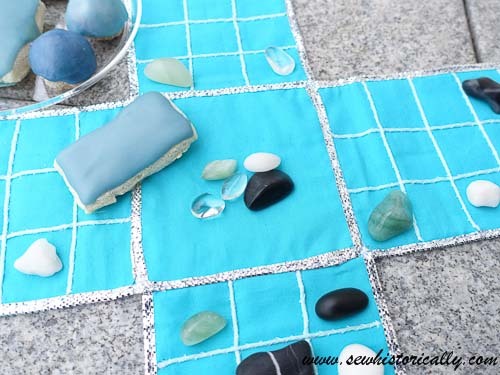 😀 And it’s so fun to use river rocks as game pieces. How very clever! 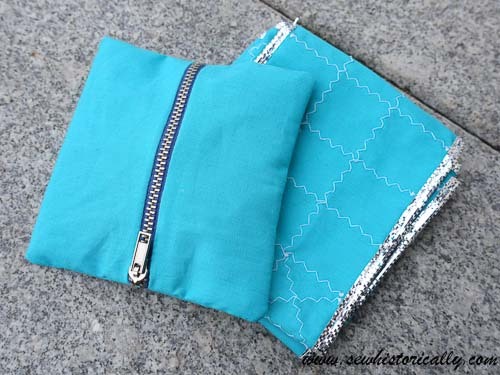 Thank you for sharing your creativity @Vintage Charm!